Regarding City Central Committee of the Democratic Party of St. Louis failing to vote against segregation. I have just learned that the City Central Committee of the Democratic Party of St. Louis has failed to place itself on record against an ordinance to segregate Negroes of this city to be voted on February 29th. Can you or your party afford responsibility of this attitude in view of the approaching presidential election? Vice President, National Association for the Advancement of Colored People. 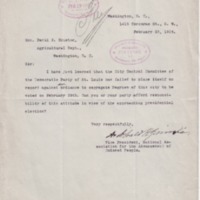 Grimké, Archibald Henry, 1849-1930, “Archibald H. Grimke to David F. Houston,” 1916 February 25, A022516, Race and Segregation Collection, Woodrow Wilson Presidential Library & Museum, Staunton, Virginia.